Tires are an integral part of cars. There are many advances in the tires of traditional cars in the modern era. From tire chambers to tubeless tires, manufacturers sought to make our long knots smooth. Tubeless tires are the most advanced technology on the market. These tires hold the air longer, and grip is also perfect. Leakage is one of the biggest tire dilemmas. Leaking tire impairs excellent travel in a short time. Familiarizing yourself with the process of repairing air leaks through the wheel rim can be very helpful. Let's talk about how to fix tire leaks in a car. of equipment. You may have to visit a mechanic for tire repair. Fixing tubeless tires is easy with the help of special machinery and equipment. Let's look at the process of fixing tire leaks on a car rim. 1. Remove the tire and start the procedure.First, remove the tire and lay it on a flat surface. Make sure the inlet valve is not facing the ground. Check for leaks or holes. It will be easier to repair the leak outside than an air leak through the wheel rim. Fill the wheel and rim mount with water. The leakage area will be identified with air leakage bubbles. Check both sides of the tire and with plain or soapy water. Locate the tire leakage and label accordingly. Drain the air from the tire by pressing the valve inlet with a pin. It is very important to let the air out of the tire before processing. Automotive equipment also includes a valve removal tool. Ensure that the leaking side of the tire and rim is visible for processing. Tire and rim attached with seal. The air inside the tire seals the seal. You may need something heavy to free the attachment. According to the maintenance tips, a heavy hammer and a wooden board will do an excellent job. It is important to remove the tire from the rim if the problem is a tire leakage around the rim seal. Hit the board with a hammer after placing it close to the wheel rim seal. Clean the edges of the tire with a cloth after removing the seal. It is easy to press the removed tire with your hands and clean it accordingly. Apply repair solution to the leak and refill the air. 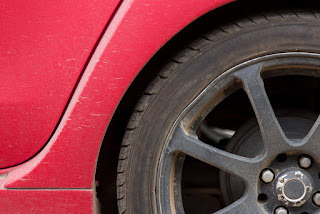 While air enters the tire, make sure that it is properly positioned. You can check the tire leak again with water. It's all about how to fix air leakage through the rim of the wheel. With the application of the procedures above the job will be perfect. Follow these vital tips and continue the perfect trip on the roads.